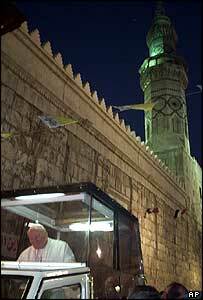 Pope John Paul is also being mourned in the Muslim world. Amongst those offering condolences are President Mohammad Khatami of Iran, a country that is 99% Muslim, and one of the senior imams in Lebanon, Ayatollah Mohammed Hussein Fadlallah. In the Arab and the Muslim world, the Pope has been remembered above all for his support for the rights of Palestinians. His opposition to the war in Iraq also won him widespread support. But Pope John Paul is also praised for his work to promote dialogue between the different faiths. He was the first Pope to pay an official visit to a mosque. In the year 2000, the Pope entered a mosque in the Syrian capital, Damascus, which also contains the tomb of John the Baptist, the Christian saint. A leading cleric in Malaysia said he hoped Pope John Paul's successor would follow in his footsteps to increase understanding between Muslims and Christians.